Congrats to Wilson Hall of Famer Gail Meier ’72 who received a Merit Award at the Northwest Baseball Coaches Convention for his 20 years plus of volunteer coaching service at Tahoma High School in Washington. 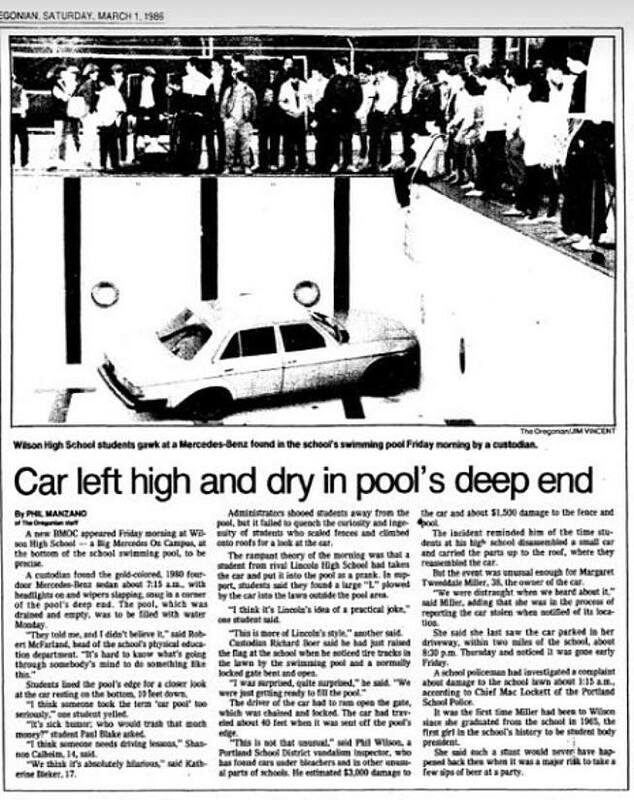 WAS THIS 1986 MYSTERY OF MERCEDES IN THE WILSON SWIMMING POOL EVER SOLVED? Let us know what you know and when you knew it. Class of '64 held our 53rd reunion at O'Connors on Saturday, September 16th. For a pre-party we held a joint, class of '64 & '65, reunion on Friday, Sept. 15th at The Old Spaghetti Factory in John's Landing. We all went on a walk across the Tilikum Crossing, and ended up eating spaghetti and pizza and sharing stories of the "good old days". Saturday night, class of '65 held their separate reunion, while class of '64 gathered at O'Connors for a buffet dinner, some great period music, and of course, lots of conversation, and catching up with our pals from 1964. We had almost 50 classmates, some traveling as far as NYC, all enjoyed the evening. We have plans to reunite next September in Portland. Place to be determined. Stay tuned. Please visit our Facebook Page, Woodrow Wilson 1964. Enjoy the photos we have posted photos of this past reunion on 9/16/17. Congratulations to the Wilson 2017 PIL Hall of Fame Inductees awarded on October 29, 2017. Talia Galvin (Filipek) graduated from Wilson in 2004. After good ole' Woody High, she says, "I went on to study Natural Resources Interpretation & New Media Aesthetics at OSU. During the summers of college, I would work seasonally in the Eagle Cap & Hells Canyon Wilderness areas of Eastern Oregon, and soon fell in love with the community & landscape of Joseph, Oregon. I recently moved here with my family and continue to work in the mountains, and also work as an editorial and portrait photographer." One of her favorite teachers at Wilson was Mr. Unsicker. She says, "Mr. U created a very inviting classroom atmosphere to admire your own history as it was unfolding! I can't help but think it was a portion of his influence that steered me in the direction of eventually working in the magazine world. Long live print!" Her advice to current students at Wilson is that "the friends that you'll keep forever, might not necessarily be the cool kids, but the ones that make you laugh till you nearly piddle, challenge you to be completely brave & completely yourself. And, the stuff you like now, it's not going away, you'll like it later too, and probably even more."